I’m not sure what to say about Athens. I want to be charitable, and I really wanted to like it. I was in the city for three nights, arriving late for the first and departing very early following the third. So, in effect, I had two days. I spent the first day roaming and, feeling a bit deflated, I used the second for writing and reading, which picked up my spirits. Long-haul travelers will be able to relate to the occasional lapse into despondency. It’s natural, and I have found the solution is to accept that it is the cause of a potentially-bad day and allow it to run its course without piling on any guilt about unmet expectations to make it worse. Bad days happen at home, too – and to everyone – so we ought not to put pressure on ourselves as people living out a dream to never have one while we’re traveling, either. I try to take the Buddhist attitude: observe that the sour feelings are there, and allow them to pass by. I met the city by way of the Aegean – from the deck of a high-speed ferry from Naxos. Rising from the sea, a blurred mass of white buildings took the place of where on any smaller landmass there’d be land. What came into focus was exciting: ancient ruins atop hills, mountains (a surprise to the uninformed – me) nestling the crowded and massive city. I felt a thrill of welcome granted me by three thousand years of architecture, art, and philosophy. This was a city for me, I thought to myself. And so, a combination of factors contributed to my downturn for my second full day, and despite a mental turnaround for my departure on the third morning, my attitude toward the city solidified all the same. I suppose the real turnaround for my attitude happened when I settled into my seat for my flight to Corfu. Here’s the honest truth: I didn’t give Athens a decent chance, maybe. 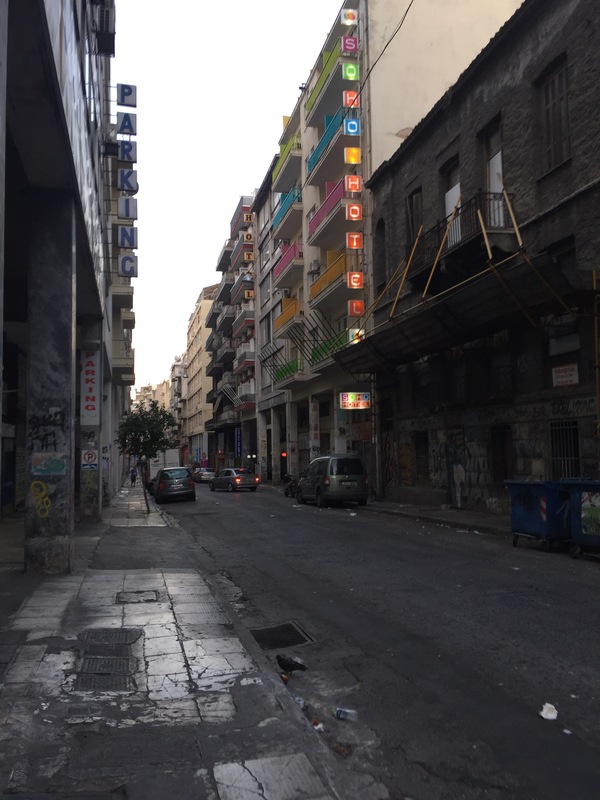 I get the distinct feeling that staying in a different part of the city – probably south of the Acropolis –, arriving at archaeological sites early in the morning, and not hesitating to spend money where on this occasion I was tight-fisted… all of this would generate a wholly different experience of Athens. I’m just not sure I am interested in returning. 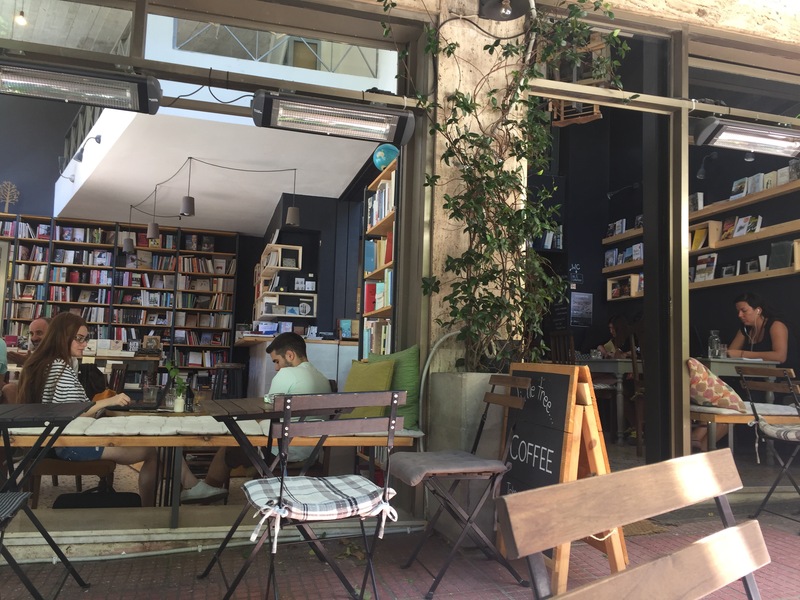 A true bright spot in my visit was found south of the Acropolis – the Little Tree Coffee & Tea cafe and bookshop (sorry, no titles in English so far as I could tell). It was a lovely and grace-saving spot where I settled to catch my traveler’s breath and reassess my attitudes on day one. Remember that you can follow all of the summer’s adventures by going to the main 2017 travel page. Please, have a look around. This entry was posted in Travelogue, Travelogue 2017, Travels and tagged aegean, athens, attitude problems, backpacking, bad day, corfu, europe, european travel, european trip, expectations, garbage, greece, metro, pickpockets, rome, Slow Travel, travel, travelers blues, traveling, travelogue. Bookmark the permalink. Phew! Misleading title. Was expecting a stolen phone, an extorting policeman, an attack of hooligans, a medical evacuation, or detainment without habeus corpus. Thankfully it was just Athens sucking. Hang in there! No, no! This was mere emotional despondency. It passed, as such things do. Some days I look at speeding trucks, wondering if I could throw myself under one. Heathrow does that to me. Athens was full of bags of rotting garbage on my first visit in 2008. Must be a regular thing. Last year I got an AirBnB not far from the Agora, and it wasn’t too bad. There’s lots of places near the Acropolis where one can wander through old ruins freely. And the Acropolis Museum is well worth a visit.